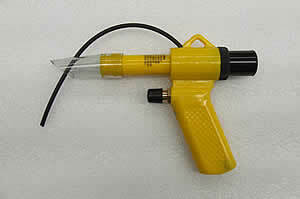 BV11 - Two in One cleaning gun. Whenever highpowered industrial vacuum cleaning or precise air pressure cleaning is required. Metal filings from around machines. Food crumbs and spilt powders. Fluids and textiles from all working machinery. The classic user for the BV11 would be foodprocessing manufacturers for the removalof coffee,tea,sugar,etc. The BV11 produces a much higher velocity than the BV22. The BV11 is an excellent tool to be used for blow cleaning machine tools such as lathes,drills, milling machines, powersaws,etc. The BV11 can also be used to provide cooling for a number of industrial and manufacturing processes. Also as an aid to combustion. Removes metal chips from dead end holes by blowing and sucking simutaneously. The BV11 D/H was specially designed with the number one feature being eye safety. 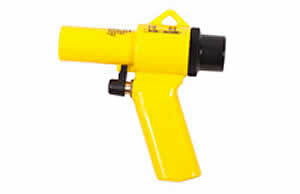 Industry currently uses conventional air blow guns to remove metal chips from dead end holes, the end result being that the chip is virtually moved from hole to hole and not removed completely. The BV11 D/H is designed to blow the chip up and vacuum it away simultaneously. The BV11 D/H was ideally designed for smaller applications in hard to get at places. Efficient and safe, the BV11 D/H handles industry's more precise clean up jobsideally used in the electronics industry and other detailed manufacturers. Made from Nylon 6 grade material and powered by compressed air, it develops a spiral air flow which allows materials to be conveyed over long distances. On Vacuum Mode Windscreen glass cuttings. Metal filings from arouno machines. Fibreglass resioue and ceramic dust. Sawdust, food crumbs and spilt powders, paper, textiles and rubber trimmings. Plastic pellets and any granulated material which is difficult to clean up. On Blower Mode The BV22 gun can be used to blow clean machine tools such as lames, driils, milling machines, power saws etc.. The 8V22 can also be used to provide cooling for a number of industrial and manufacturing processes Also as an aid to combustion. 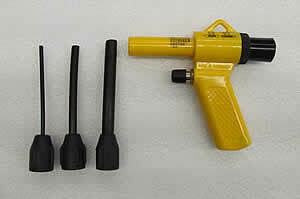 Includes crevice tool, round brush, oval brush, straight and bent extension, and nozzle cap.